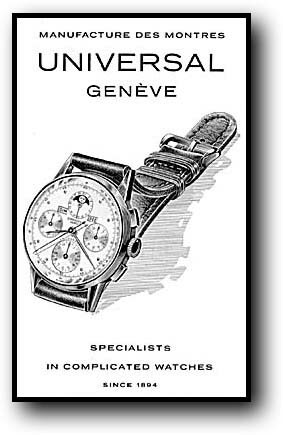 Numa-Emile Descombes and Ulysee Georges Perret registered the name Universal at a Swiss watch-making center, the Rue du College, in Le Locle. 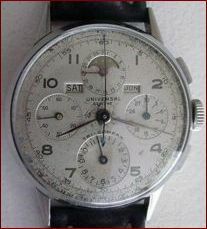 The first Universal chronograph made. The company moves to rue de l'Arquebuse, Geneva (Genève). 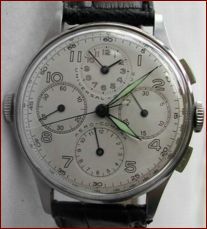 The "Compur" chronograph debuts - the first two-pusher system (allowing the wearer to start and stop the seconds hand, avoiding an automatic return to zero). 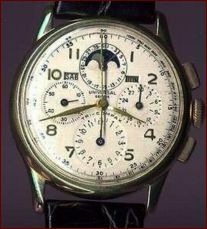 The world's first hour counter sub-dial, allowing timing on longer events, debuts. Previously timed periods could be no longer than forty-five minutes. 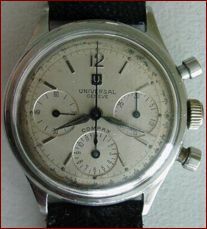 The company was renamed Universal Genève. 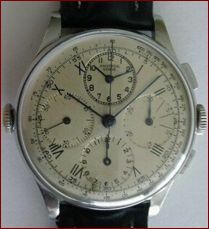 The "Compax" debuts - the first to combine two pushers and a 12-hour counter sub-dial. The "Medico Compax" assists doctors to measure patients' pulse rates more accurately. 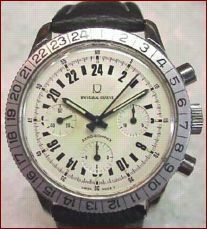 The "Aero Compax" - for pilots - displays two time zones. 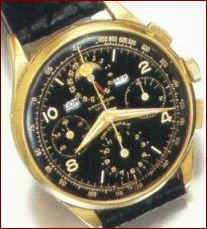 In the company's golden anniversary year the "Tri-Compax" is introduced. 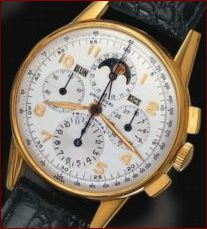 The Tri-Compax is a tripledate moonphase chronograph. 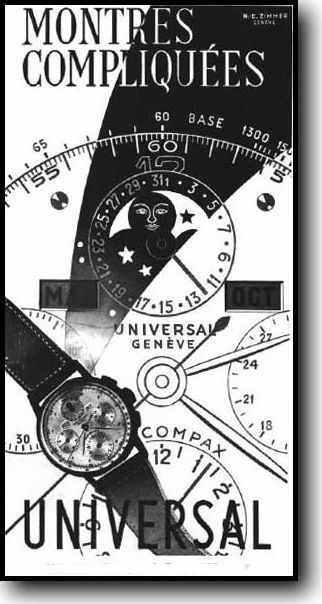 It's the moonphase dial that's the most distinctive part of the Tri-Compax face. 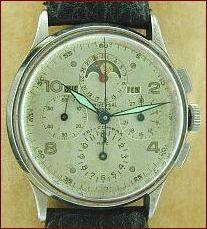 The disc therein, sporting a painted facsimile of the moon, makes one revolution each 29 days; a lunar month. 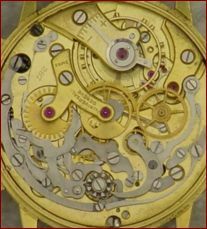 What could be more attractive and powerful than having the entire cosmos on one's wrist? 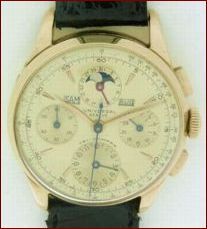 The Tri-Compax has a 17-jewel signed manual wind calendar/chronograph movement (cal. 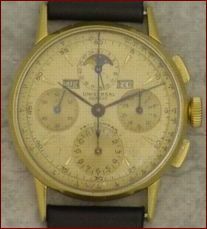 287), round snap back case (the watch comes in a variety of widths), a satin painted numeral dial, and four registers; constant seconds, 30-minute and 12-hour recorders, date, apertures for month, day, and phases of the moon, chronograph sweep seconds, dial calibrated for tachymetre. Some date information gratefully taken from the company web site.